Laurence O'Fuarain in 'The Limit Of'. Producer Tim Palmer (‘Into the West’, ‘Patrick's Day’) gives us a first look at Artwork for Alan Mulligan's new gripping psychological thriller ‘The Limit Of’. Featuring rising stars Laurence O'Fuarain (‘Vikings’, ‘Don’t Go’) and IFTA nominated Sarah Caroll, Mulligan’s directorial debut opens in Irish Cinemas on April 5th. Created by Alan Mulligan and producer by brother Anthony Mulligan, alongside producer Tim Palmer (‘Into The West’, ‘Patrick’s Day’), ‘The Limit Of’ premiered to acclaim at the Galway Film Fleadh. It’s a story rooted in Alan Mulligan’s career as a young banker during the Celtic Tiger years and its crushing aftermath. The film captures the rapacious greed of the financial world and society’s ever-growing need for control. Mulligan’s slow, deliberate style builds a fever pitch of intensity as the film reaches its shocking climax. The poster artwork was done by John Talbot of Galway's Panic Post Production. 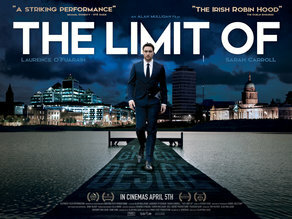 Sentioar will release ‘THE LIMIT OF’ in Irish Cinemas on April 5th.